When we arrived, the site for the development center was just a dirt field, used by the community for occasional football (here, = soccer) matches. It is located not far from the main intersection of Yele - the Junction - and is sandwiched between the primary and secondary schools. 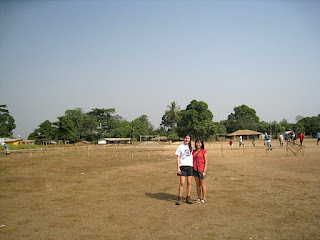 The construction was delayed because the village decided to hold a festival here, but once we arrived the local contractor was already there to mark out the site boundaries for the first part of the project. In the time since the first photo, the concrete foundation and slab were laid and poured with the help of 73 men from the local area. It was quite the sight! Although I myself am not doing much of the physical work this time around (sort of a strange feeling), I'm glad to know that we're at least providing jobs for people who need them. 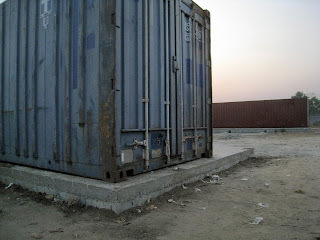 The shipping containers were supposed to be moved on site last Saturday, but this was delayed because the equipment to do it and the medical supplies it was supposed to deliver was stuck in customs. Finally, though, we have 2 containers on site! Community members have been coming by to see what has been going on, and we're getting more questions about e-Luma and the opportunities it will bring. Yesterday Anna and I spent 3 hours in the Junction, talking with local shop owners about e-Luma and handing out application forms. Despite our lacking Temne skills, we managed to get our point across with pictures and images (thanks to technology like Photoshop and Illustrator to make brochures and renderings). I'll upload some drawings of the design in the next post. As an update on the team, Paul and Anna got engaged last Friday on Monkey Island, Paul and Greta (volunteer nurse from the Philippines) left on Sunday, and now three more people with the Foundation - Donald, Stephen, and Maria - will join us on Friday. The house will be full again in our last week in Yele, and a lot will be happening!